While initially Nokia Lumia 900 was a AT&T exclusive, it is now about to spread its wings in the United Kingdom. It will be available through Phones4U and the Carphone Warehouse. According to Phones4U the expected delivery date is April 27th where are Carphone Warehouse is not committing to any specific date, but sticking to a very general ‘May’ availability. The phone is identical to the one being sold in USA, the only difference being the lack of any LTE support. UK users will however be able to use HSDPA which is no slouch either. If you pre-order from Phones4U you will get a free Play 360 Bluetooth speaker which itself is worth 120 pounds. 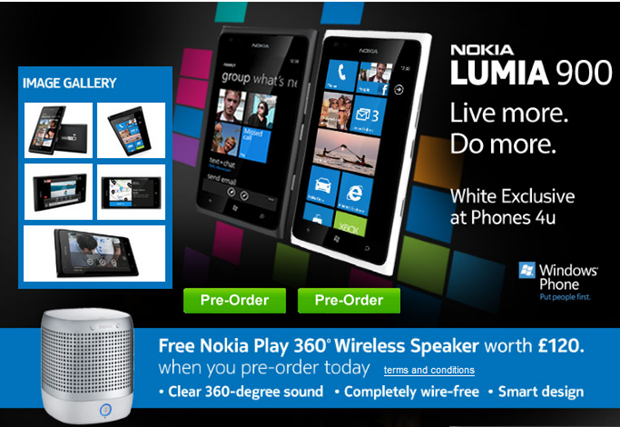 Phones4U will also be offering the white version of Lumia 900 exclusively. Carphone Warehouse on the other hand is not taking any pre-orders now but I suppose they will start those in a few days. Right now you can only register for more information. Though no official numbers are out, Lumia 900 has enjoyed moderate success in the States. How it will fare in the UK, especially without the kind of AT&T advertisements, only time will tell.